Charlotte the baby flying fox in this video lost her mother after her home in Brisbane, Australia experienced an overabundance of rainfall. Thankfully for her, some kind humans who work as wildlife rehabilitators found her before she was lost forever. Since then, they’ve been acting as surrogate mothers until Charlotte gets big enough to live on her own. Flying fox mothers are extremely nurturing and attentive. They go to great lengths to ensure that their babies stay warm, well fed, and clean. 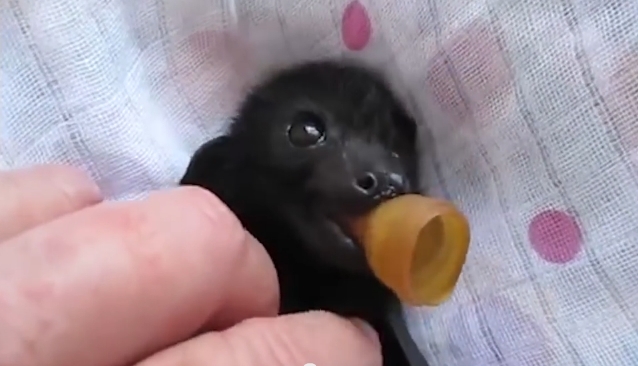 Baby flying foxes even lack fur on their bellies just so they can absorb body heat from their mothers. This means that her new human mothers have to have their parenting game on point! The belly rub you see Charlotte getting is a pretty typical occurrence. They do it multiple times daily to help her feel warm, calm, and safe. Charlotte may be small now, but she’s going to be a sight when she gets older. We can’t wait to see the footage of her being released back into the wild! Responses to "Sweet Flying Fox Lost Her Mom so Kind Rescuer Gives Her Massages Every Day"
So unbelievably cute and awe-inspiring. Thank you to those who rescue these tiny creatures and help preserve our web of life.